In the previous post, we covered the detailed steps for building a prioritization scoring model. In this post we will cover the steps for prioritizing projects with a scoring model. The last part of the scoring model is to determine the scoring values. For each criterion in the scoring model, there needs to be some evaluation of a low, medium, or high score to drive a numerical score for that criterion. In practice we can expand this to “none”, “low”, “medium”, and “high” to give the decision makers a slightly wider range of options. We do not want too many options as this can slow down the scoring process, but we want enough options to help distinguish project evaluations. A common scoring paradigm would include 0 for none, 1 for low, 2 for medium, and 4 for high. 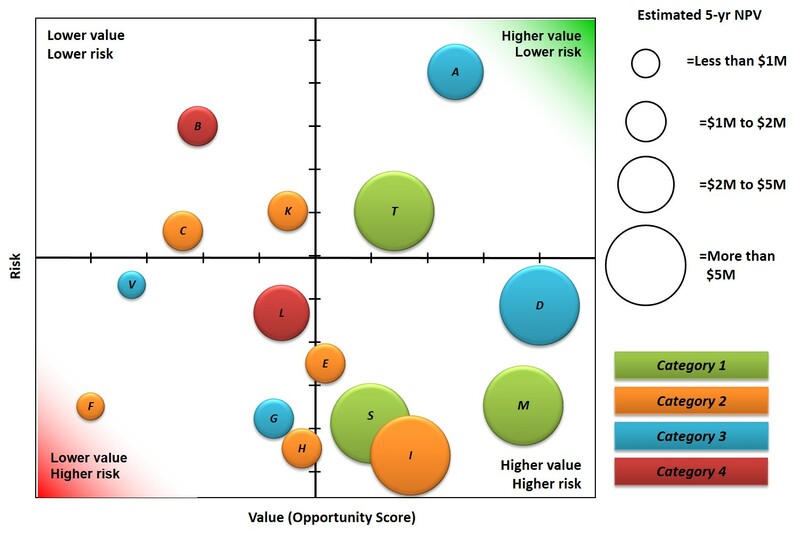 If companies want to put even more emphasis on high value, they could use a 0, 1, 3, 9 scoring paradigm. In the example below, each of the four qualitative values has a corresponding quantitative value. For each value, there is a definition to help determine to which value the project best aligns. If the governance team determined that a particular project has a medium alignment to strategic objective #1, it would score a 2. We will explore all of the calculations at the end of this post. The definitions alone can significantly improve the quality of the project scores. The example below is relatively generic and requires the governance team to possess enough knowledge about the project and the strategic objective to properly determine the degree of strategic alignment. This can be problematic if the governance team “feels” that a given project has moderate to high alignment and therefore warrants a higher score. The scoring process is intended to make the prioritization process as objective as possible. This can be accomplished by more specifically defining the underlying criteria of “none”, “low”, “medium”, and “high”. In example #2, an IT department of a large Fortune 500 firm has a specific strategic objective to reduce the number of legacy computing systems. The criteria for each of the four options is far clearer with little need for interpretation. If the project actually decommissions a system, it scores “high”. As companies mature their evaluation process, the specific criteria for none through high can be enhanced. For financial evaluations, it is important to set financial thresholds that will really set the winners apart. If the bar is set too low, too many projects will get “high” scores and the scoring model won’t be of much help to distinguish the highest value work. For the riskiness evaluations, we need to flip the quantitative values so that the highest number corresponds to the lowest risk qualitative value. By doing so, we are giving more value to less risky projects. This makes sense especially if we have two projects which may be nearly identical in value but one is far riskier than the other; under normal circumstances if we could only choose one over the other we should choose the less risky option (i.e. better risk-adjusted value). In order to evaluate projects or new proposals, some amount of information is needed to understand the scope, importance, alignment, cost, benefit, and risks of the project. Based on the actual scoring model you built and your current organizational processes, you may already have all the information you need to use the scoring model. In other cases, new information needs to be collected. Let’s break it out in further detail. Strategic information: at some point during the intake/proposal phase, the project initiator for each proposal should have provided some rationale for how the proposed project aligns with one or more strategic objectives. Simply stating that alignment exists is not useful; there should be an explanation of how the project supports the organization’s strategic objectives. This information should be captured in a document for each governance team member to review. If this information does not exist (or does not exist for all current projects), the Project Sponsor can help explain strategic alignment when the governance team evaluates the projects. If most current projects are missing this information, the Project Management Office (or other team facilitating the prioritization process) should update organizational processes to include this information going forward. Financial information: assuming that your scoring model utilizes quantitative financial information, it is very important to ensure that this information is available for all projects (a common challenge for many organizations). The best approach is to work with the Finance department to do some level of financial analysis to determine financial benefits for each project. This will lead to consistent financial information across the portfolio. Without Finance’s help, most organizations struggle to get meaningful financial benefits. The best alternative to getting Finance’s help is to provide spreadsheet templates to each project team to assist with calculating the financial metrics used in the scoring model. Riskiness information: information about the inherent riskiness of the project is useful for conducting this evaluation. It is important to keep in mind that this assessment is not about the specific project risks (although this could be useful), but about the inherent risk nature of the project. Answering questions such as: “how much organizational disruption will this project cause?” “How much experience do we have with this type of project?” “Do we have a sufficient skill set internally to deliver this project?” are important to evaluate the riskiness of the project. Ideally, some of this information is contained in the business case, project proposal form, or even in a project charter. Financials: this is easily derived from the financial analysis and no additional evaluation is needed. A Portfolio Analyst or PMO Administrator should be available to compile this information and capture it in a single data repository. Riskiness: The Project Manager or PMO Director will be in the best position to evaluate the riskiness of a project. The PMO Director could be the singular person to evaluate riskiness across all projects in the portfolio, which streamlines this evaluation. Alternatively, each Project Manager could evaluate and score individual and share the results with the Portfolio Analyst or PMO Administrator. A group of Project Managers could come together and work together to score their projects as individual Project Managers may interpret criteria a little differently. Prepare summary information of each project for the Governance Team to read on their own before the meeting (examples include: business case, charter, etc.). The advantage of this approach is to expedite the scoring exercise. Prepare summary information of each project for the Governance Team to review during the meeting. Using this approach, the Governance Team would likely review a batch of projects and score them in the same session. The advantage of using this approach is that everyone will have dedicated time to review project information and discuss as a group. This option also takes longer than option 1. Conduct mini project reviews in a team meeting with the Project Managers in attendance to present and answer questions. The advantage of this approach is that it gives the Governance Team an opportunity to ask important follow-up questions as well as get to know the Project Managers better. This option takes longer than the previous two options. Conduct the pilot with the governance team in person: even after prioritizing criteria and discussing it as a team, there will still be questions about specific projects and how they align to the strategic objectives. Build in adequate time for discussion: there will be different degrees of understanding of the projects and some projects will require more discussion than others. The value is in the discussion, so build in adequate time for discussion so participants do not feel rushed. After the pilot, get agreement on how the governance team wants to finish scoring projects. Some teams will want to continue scoring as a group; others may want to do their scoring in advance and come prepared to discuss. Take time to review and validate consistency of scores: some governance team members may be surprised about the scores of certain projects. It is not unusual for some medium and high scoring to be inconsistently applied. The group may have determined that a project was a “high” in one case but after review, it should really be a “medium” or vice versa. In the next post we will cover the relationship between priorities and resources and the need to reinforce over-communicating priorities and how this affects resource allocation. In our hyper-accelerated business world, data analysis and data visualization are exceptionally important. In the realm of project portfolio management (PPM) and PMO’s, organizations need robust data analysis to strengthen decision making and improve strategic execution. The key is to have the right processes in place to collect the right data and ensure that the data is of good quality. As I have said before, data collection is not free; any data that is collected but not actively used is a waste of organizational resources. Knowing what information is needed to drive better decision making will help ensure that only important data is collected. Therefore, organizations should wisely consider what metrics, analytics, and reports are most important to senior leaders and then develop or improve the processes that drive the collection of that data. The power of having good portfolio data is to conduct strong portfolio optimization. Descriptive analysis—this helps answer the basic “what has happened?” This level of analysis is the most basic as it is fact-based and is required for developing key performance indicators and dashboards. Predictive analysis—this helps answer a more important question, “what will happen?” With sufficient data, organizations can begin to predict outcomes, especially related to project risk and project performance and the impact to project delivery as well as the portfolio as a whole. 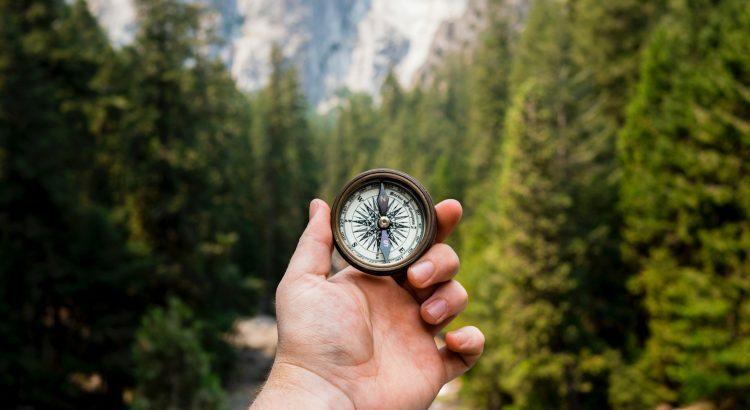 Prescriptive analysis—this helps answer a more difficult question “what should we do?” This requires more detailed and advanced analysis to determine the optimal path against a set of potential choices. Prescriptive analysis of the portfolio provides significant benefits by enabling organizations to choose the highest value portfolio and choose a group of projects with a higher likelihood of success. Cost-Value Optimization: this is the most popular type of portfolio optimization and utilizes efficient frontier analysis. 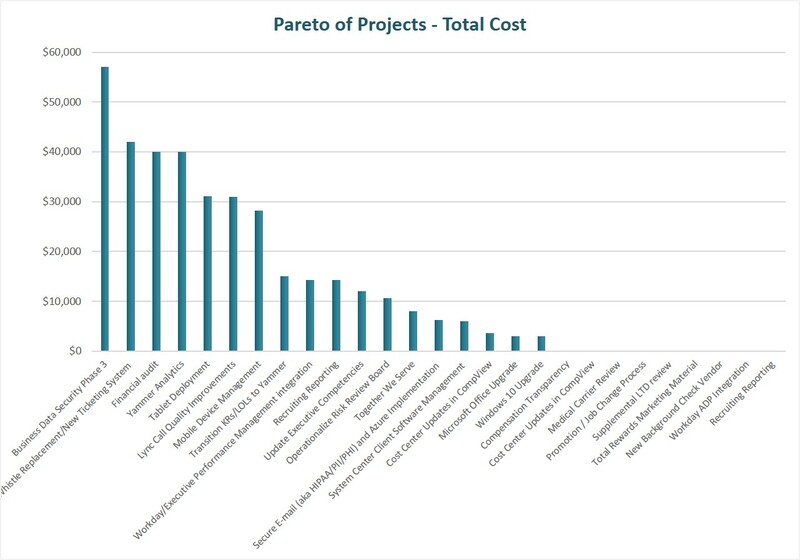 The basic constraint of cost-value optimization is the portfolio budget. Resource Optimization: this is another popular way of optimizing the portfolio, and utilizes capacity management analysis. The basic constraint of resource optimization is human resource availability. Schedule Optimization: this type of optimization is associated with project sequencing, which relates to project interdependencies. The basic constraints of schedule optimization are project timing and project dependencies. Work Type Optimization: this is a lesser known way of optimizing the portfolio, but corresponds to a more common term, portfolio balancing. The basic constraints of work-type optimization are categorical designations. The following diagram summarizes the above points and highlights how having the right data inputs combined with constraints and other strategic criteria can produce optimial outputs across four dimensions of portfolio optimization. 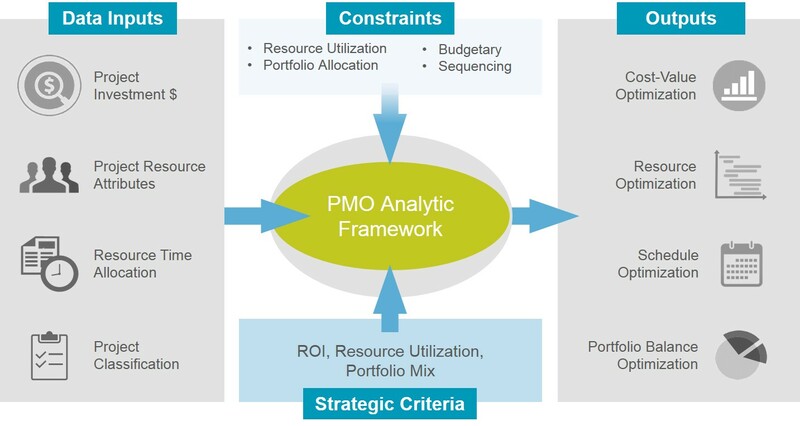 Point B Consulting’s 5-step methodology for conducting PMO analytics enables organizations to realize the full potential of their analytic processes. In summary, portfolio optimization delivers significant strategic benefits to any organization, but getting the right processes in place to collect good data is not easy. Having the right data can enable your organization to know what is happening to the portfolio (descriptive analysis), what could happen (predictive analysis), and what senior leaders should do (prescriptive analysis). After reading the first three chapters of A Fish In Your Ear, I stopped reading it for about a year. A lot of time is spent discussing the psychology of decision making, which is not often covered in the PPM literature, but it wasn’t enough to keep my attention. I came back to the book a year later and am glad I did because the best part of the book is in chapters 4-7. Chapter 4 describes the importance of managing portfolio data, data integrity, and how to collect the right data. He opens up the chapter with a great quote by Bill Gates, “How you gather, manage, and use information will determine if you win or lose.” Early on Menard mentions that an organization’s central nervous system is its information management system and that an organization is only as effective as its knowledge is good. After a solid discussion on variables, data integrity, data-quality influencers, and other items he concludes the chapter on data collection. The list of questions in this section is one of the gems of the book. Menard does a great job of highlighting how asking the right questions can uncover the data needs of the organization. Chapter 6 continues with a good discussion of data visualization. I fully agree that in order to make sense of so much data, it has to be visualized. 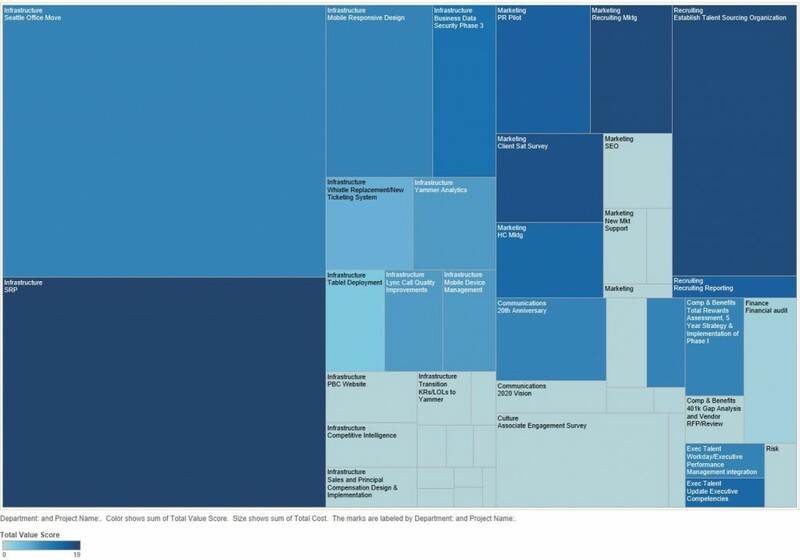 Not only GenSight, but companies like Tableau are working hard to help users visualize data. The results can be very enlightening. In this chapter, Menard discusses the various elements to help visualize data: color, shapes, size, and matrices. He concludes with visual rules: give people what they want, show what matters, make it rich, make it valid, and have a purpose. Chapter 7 focuses on portfolio selection. He brings up two burning questions early in the chapter: “will this portfolio deliver our strategic goals?” and “do we have enough appropriate resources to execute the portfolio?” The first question touches the matter of what the organization should do, the second on what they can do. The second half of the chapter provides a great discussion on the matter of portfolio optimization. 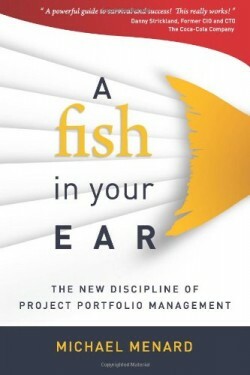 In short, chapters 4-7 of A Fish In Your Ear are worth the price of the book and provide some of the best explanations of collecting and utilizing portfolio data that I have read. Rating: 4 out of 5 stars. Data represents a major facet of successfully implementing project portfolio management (PPM). In a previous post, I discussed how data drives the portfolio management engine and some of the key components for getting good data into the tool. Some important portfolio data types includes: financial data, resource data, schedule data, and benefits data. Leadership plays a pivotal part in the whole process from determining which data is needed to using the data for better decision making. This post will concentrate on the last part of the process—how to use the portfolio data. Data quality is never perfect at the beginning of a portfolio management process. Collecting data takes time and effort, and with so much demand on individual’s time, people do not want to waste time collecting data that is unnecessary or won’t be used. This is why it is so important for senior leaders to use the portfolio data. When leadership uses the data, they will understand what data is truly needed for higher quality decision making. Moreover, once the data gets used, the gaps in the data will be readily apparent and will give senior leaders an opportunity to reinforce the importance of the portfolio processes (that collect the data in the first place). However, using the data is only the first step in a three step process. Next, leadership needs to communicate that the data is being used. Communicating that the portfolio data is being used is a conscious effort on the part of the senior management team, but is something very easy to do. It can also easily be overlooked. Think about it. Project managers and resource managers can put data into the PPM system not knowing if it is simply going into a black hole or is actually helping the organization. Without communication, they may never hear whether the data is actually being used. A prime example occurs with resource data and capacity management. In order for capacity management to be successful, good data is needed, which takes a lot of effort by project managers and resource managers. If the project managers and resource managers do not believe that the data is actually being used, there will be less effort going forward in entering and maintaining the data. Even when an organization is mandated to use a PPM system, the data can be compromised by a small number of people who do not take the process seriously. Communicating that the data is being used is necessary for reinforcing the importance of the portfolio processes, yet senior leadership needs to take one more step—demonstrate how the data is being used. Communicating that the data is being used is good, but demonstrating how the data is being used is even better. This will send a clear message to the organization of how important it is to maintain accurate and up-to-date information in the portfolio system. If the data is being used to drive decisions around strategic project investments, staffing plans, bonuses, etc., then people will be more likely to spend the time to enter, update, and maintain the data. However, if the data is used to create a report that merely scratches the itch of a curious executive, then the people involved with the portfolio processes won’t have much interest in making sure that the data is accurate and up-to-date. Using portfolio data, communicating that the portfolio data is being used, and demonstrating how the data is being used are the responsibilities of senior leadership. None of these steps are difficult, but need to be taken on a regular basis if the organization wants to be successful with portfolio management. Collecting data comes at a price, and if the data isn’t being used, it is better for the organization to stop wasting its time and focus on things that move the organization forward. A small amount of effort on the part of the senior leaders can go a long way toward making portfolio management successful and useful. Data is the fuel that runs the portfolio engine. Bad data will clog the engine; good data will help the organization sail forward. Using the data, communicating that the data is being used, and demonstrating how the data is being used will not only make the difference in being successful at portfolio management, it’s also smart business. From a very pragmatic point of view, getting the right data at the right time is at the heart of good project portfolio management. If the right data is not available for decision makers to use, the issue will be mediocre results at best. Portfolio management is about selecting the right projects, optimizing the portfolio to deliver maximum benefit, protecting portfolio value to ensure that that value is delivered, and improving portfolio value by maturing organizational processes. At every step, data is required. 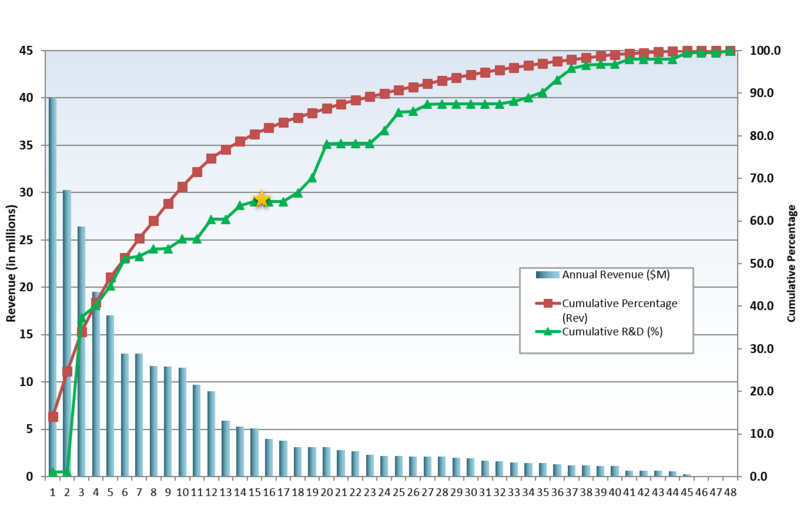 The quality and quantity of data correlates to portfolio maturity. Some less mature organizations will collect insufficient data which leads to sub-optimal decisions. Other organizations may try to collect too much data before they are ready to utilize it and can do more harm than good by burning out employees with burdensome processes. Mature organizations will have the discipline and rigor to collect the right amount of quality data. Senior management bears the responsibility for identifying the right data to be used in the portfolio management process. In addition, senior leadership needs to drive the accountability for collecting the right data. 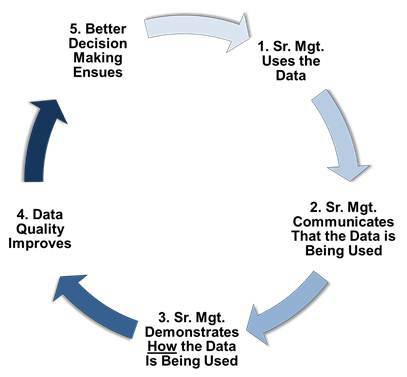 Without active engagement and feedback from senior management, data quality can suffer. Organizational processes are very important for ensuring that the right data is collected. Selecting the right projects requires that good data is collected about each candidate project. Such data must be relevant to the senior management team that makes portfolio decisions. Data that is not used for decision making or information sharing is considered a waste. Collecting data comes at a cost, and organizations need to put the right processes in place in order to collect good data. From this angle, portfolio management processes are about collecting a sufficient amount of the right data. Without good standards and processes, important portfolio data will be collected inconsistently resulting in confusion and possible error. Portfolio tools have a very important place in the portfolio management ecosystem, but only after leadership has identified what is required and lean processes have been created to facilitate data collection. 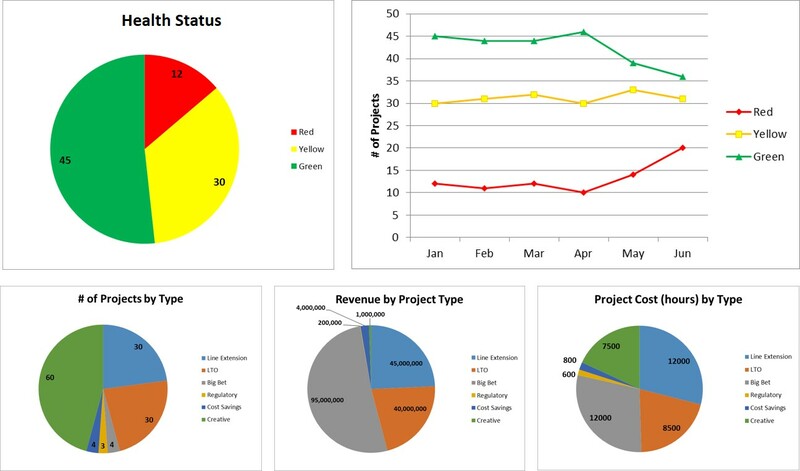 Portfolio systems store and transform project and portfolio data for general consumption (aka reporting and analytics). For less mature organizations with fewer data requirements, simple portfolio systems such as Excel and Sharepoint can be used in the portfolio process. Maturing organizations should select portfolio software that meets the needs of its data requirements. Lastly, senior leadership needs to use the data in the system for making better portfolio decisions. Strong portfolio systems will generate the reports and analytics necessary to support better investment decisions. 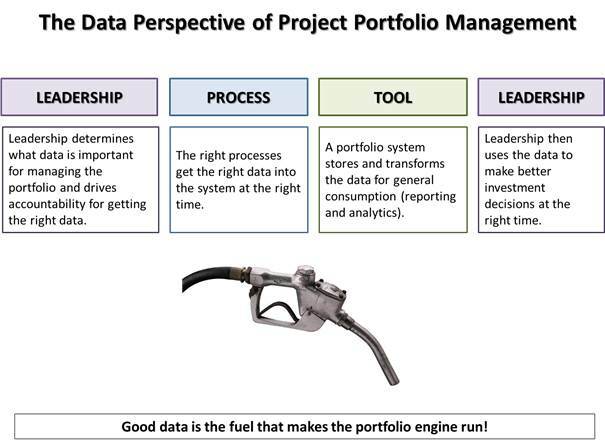 Good data is the fuel that makes the portfolio engine run! Without good ‘fuel’, senior management will be unable to drive the organization toward its strategic goals. 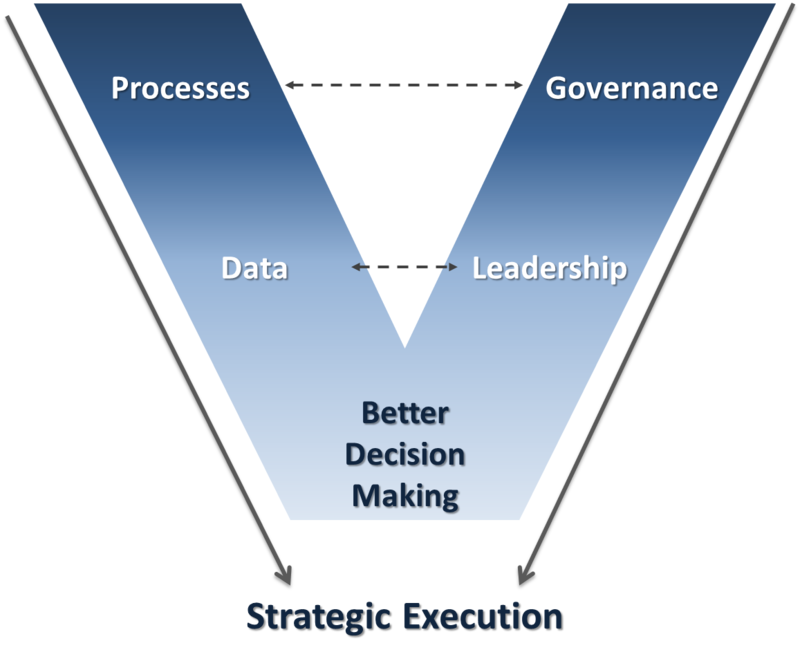 The data perspective of portfolio management begins and ends with senior leadership.